You are here: Home / Ethnic Groups / The People of Sulawesi / Who are the Wawonii? The Wawonii live on the island of Wawonii (‘coconut mountain’), located off the southeastern coast of the major island of Sulawesi, and on the tiny island of Menui to its north. 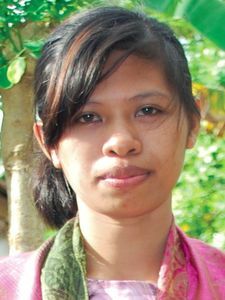 Although not much information is currently available about the Wawonii, what is available shows a way of life similar to their better known neighbors living on Buton and Muna islands. All of these groups once belonged to the sultanate of Buton. The sultanate included Buton, Muna, Kabaena and other small islands. The Sultan of Buton ruled the Wawonii through a hierarchy of advisors and officials. Local chiefs, who were selected from the families of their predecessors, lived in the capital. The Wawonii were under Dutch rule from 1910 until 1949 after which time they became part of the newly independent Indonesian nation. The Wawonii language is part of a larger linguistic grouping called the Eastern Bungku-Tolaki subfamily, which also includes the Moronene, Kulisusu, Taloki, Koroni, and Mori languages. Wawonii has two dialects, which correspond to the two islands where it is spoken. The Wawonii’s primary livelihood is growing corn. Crops other than corn include sugar cane, tobacco, coffee and various vegetables. New fields are opened by the “slash and burn” technique of cutting down trees and burning the underbrush. The Wawonii are forced to move each time their fields become infertile, because their farming techniques do not include sustainable methods. Their houses are spread throughout the new areas they clear out of the jungle. Houses are built on stilts with high roofs made of woven thatch. They are still familiar with the different social classes. The Wawonii use the typical groupings of nobility, middle class and common people. Usually, each respective class has its own customs, in addition to their various traditions and habits. The privilege of owning land is decided by the community advisory committee, which has unconditional authority over all the land. The lineage of descent of the Wawonii is patrilineal (tracing descent from the father). In Wawonii marriages, the groom pays a bride price to her family. This price is determined by the groom’s social status in the community; the higher his status, the higher the price. Before the marriage, the future husband must undergo a trial period by his future in-laws. However, this requirement is the main cause of many elopements. Almost all Wawonii people practice Sunni Islam. Despite this, traditional animistic beliefs are still strong in daily life. They still believe in the power of unseen spirits that inhabit sacred places. The services of a dukun (shaman) are often sought for many purposes, including healing sicknesses and exorcising evil spirits. The Wawonii need better agricultural education to create sustainable, eco-friendly farming methods. The Wawonii have inadequate employment opportunities and the creation of new jobs is much needed. In order to improve health services for the community, they also need better access to medical services, clinics and medical personnel.